Located in Whitstable, nr Canterbury, Kent. Sage Installations have developed a good reputation for fitting bifold doors to all types of property. We supply the ultimate in open-plan living unfold beautiful BiFold Doors bringing the outside in, with style and security. Maximum versatility – with multiple opening options you can let your imagination run wild! 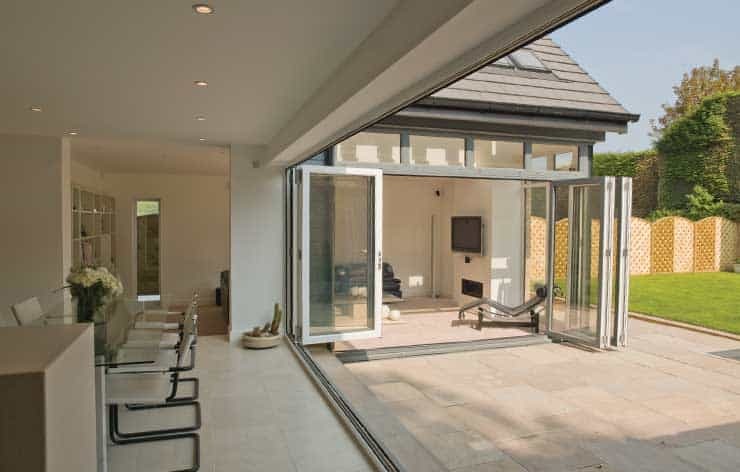 With modern, sleek elegance, bi-fold doors are an increasingly popular addition to the latest home and commercial projects, creating a large opening with a low threshold for easy access that makes a stunning difference. With help from Sage Installations, we can offer one of the biggest choices of these designer essentials that aren’t just versatile and precision-engineered but also easy to install, helping you maximise sales while your customers maximise light and space. Sage Installations can also handle the removing of old doors and the opening up of windows to allow for new doors and much, much more. We don’t need to have an existing door to work with to instal and new Bi-fold door. Accreditation by British Standards Institute (BSI) and approval by the Association of Chief Police Officers’ Secured by Design initiative and the Police Preferred Specification PAS23 & PAS24. Aspect comes with an exact colour-match guarantee. That means the colour is precisely matched to our window, door and conservatory roof products, creating a co-ordinated, consistent look across any property. A range of external colours is available to complement existing architectural style, as well as a choice of hardware colours. Aspect has a white internal finish as standard, to maintain a bright, fresh interior, with some colours available with colour both sides from stock.